Water is a substance that is absolutely essential to life. In order to survive, the cells that make up the human body need a substantial amount of water. However, it turns out that most people are not getting quite as much water as they need. Though a person may be able to function on low levels of water, they will not be at an optimal level of performance. One woman found out just how vital water was when she tried a new experiment with water. 42 year old Sarah Smith was a busy mother of two who frequently suffered from headaches and digestion issues. Though she had a drink with each meal, she was just drinking about four or five cups of water each day. Sarah visited a nutritionist who recommended that she start drinking 3 liters of water each day for a month. She documented the results, which were truly eye-opening. In just one month, significantly positive changes occurred, and Sarah’s friends told her that she looked ten years younger after just a month of adequate hydration. Her skin was smoother and severe wrinkles were almost nonexistent. After one week of drinking water, Sarah began to feel a bit better. As the water flushed toxins from her body, she did begin to have some mild acne breakouts. However, Sarah was happy to note that her headaches were gone, and her joints did not feel as stiff anymore. Sarah began to notice improvements after two weeks of drinking water. The wrinkles under her eyes filled in slightly and looked less dark. Her skin did not look as blotchy and rough. By the third week, Sarah had noticed a beneficial side effect of drinking enough water. She did not feel compelled to eat as much, so she was losing bit of weight. 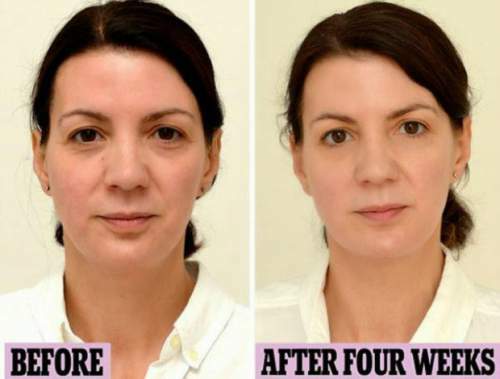 The puffy wrinkles and dark circles around her eyes were far less noticeable. The results after four weeks of drinking were truly fantastic. Sarah felt “fitter, leaner, and healthier,” and her skin was extremely improved. The blotches, dark spots, and wrinkles were replaced with smooth, evenly toned skin that looked youthful and healthy. Scientific studies support Sarah’s findings. In a 2007 study published in the International Journal of Cosmetic Science, test subjects who drank 2.25 liters of tap water each day for four weeks improved their skin. Skin became thicker and more dense, so fine wrinkles disappeared and skin began to look smooth and supple. This effect was even more noticeable in the subjects who were not drinking even the daily recommended amount of water each day. People who are underhydrated have less blood circulation and cell regeneration, which harms the skin. Doctors recommend that people drink at least eight cups of water each day, but many people, including Sarah, are only drinking about four cups of water each day. Though coffee, soda, and other drinks contain some water, they do not actually have enough to meet daily water intake recommendations. It is important to get at least eight cups of water each day, and drinking up to 12 cups may provide more benefits to the appearance and health of your skin. If you are not getting enough water, you may notice that your skin looks fragile, thin, and wrinkled. The lack of adequate circulation can lead to huge dark spots under the eyes. As Sarah discovered, just a minor change in her habits had a huge effect on the health of her skin. Drinking extra water is not difficult or expensive, and it can make a huge difference to the health of your skin.